It offers you the necessary tools to produce personalized alphabets & lettering embroidery designs through Internet. It offers you the necessary tools to produce personalized photo stitch embroidery designs through Internet. It offers you the necessary tools to produce personalized motifs & embelishments designs through Internet. It offers you the tools to identify, examine, compare & search embroidery thread color codes of several manufacturers. It offers you the necessary tools to produce personalized monogram embroidery designs through Internet. It produces personalized cross stitch embroidery designs. Upload your photo & convert it to stitches in a few seconds. Web Lettering Pro offers you the necessary tools to produce personalized embroidery texts through Internet. If you want to offer Web Lettering through your web site, read the conditions here. It is really easy to use (only one step), doesn't require previous training and it's very fast. The lettering design and the stitch generation demand a few seconds. Web Lettering Pro produces embroidery designs in some adequate formats for embroidery machines (home or commercial). Web Monogram offers you the necessary tools to produce personalized monogram embroidery designs through Internet. It is really easy to use (only one step), doesn't require previous training and it's very fast. The monogram design and the stitch generation demand a few seconds. Web Monogram produces monogram designs in some adequate formats for embroidery machines (home or commercial). Web Motifs offers you the necessary tools to produce personalized motif embroidery designs through Internet. It is really easy to use (only one step), doesn't require previous training and it's very fast. The motif design and the stitch generation demand a few seconds. Web Motifs produces motif designs in some adequate formats for embroidery machines (home or commercial). Web Photo offers you the necessary tools to produce personalized photo stitch embroidery designs through Internet. It is really easy to use (only one step), doesn't require previous training and it's very fast. The design and the stitch generation demand a few seconds. Web Photo produces embroidery designs in some adequate formats for embroidery machines (home or commercial). 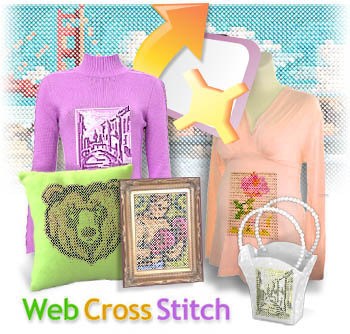 Web Cross Stitch offers you the necessary tools to produce personalized cross stitch embroidery designs through Internet. Web Cross Stitch produces embroidery designs in some adequate formats for embroidery machines (home or commercial). Web ETCharts offers you the necessary tools to identify, examine, compare and search for embroidery thread color codes of several manufacturers. It is really easy to use (only one step), doesn't require previous training and it's very fast. The required search demands a few seconds. Your company will be more visible, increasing your oportunities to produce contacts and sales. What is PE Resource Center? Which is the cost of it? All the companies related to this activity could subscribe and advertise free. There are also some paid advertising plans at very competitive prices. Visitors have free access and require no registration to use the Resource Center. You will get new customers and business opportunities. Find products, services and suppliers for your activity.